Finding the right language service is particularly important for the advertising industry! You are not only conveying a message, but also an emotion. 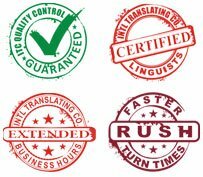 It is imperative that your translation service provider has a flawless grasp on both linguistic and cultural nuances. Advertising messages must be translated in a way that delivers the intended meaning across cultures and invokes the desired action. Remember, the meaning behind a single word can be interpreted in a vastly different fashion in another country.